How did you celebrate Martin Luther King Jr. Day? This is the first year that I’ve talked to my preschooler about this holiday. We read a bunch of picture books celebrating diversity and service (links below) and talked about what it means to dream and treat all people kindly, no matter what they look like. 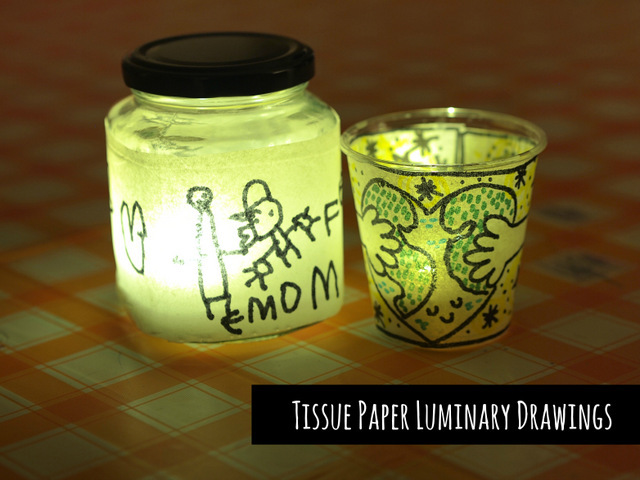 Being a craft lover, we also sat down and made these Tissue Paper Luuminary Drawings. I love the discussion that we had while making them and I love how they beautiful they turned out too! 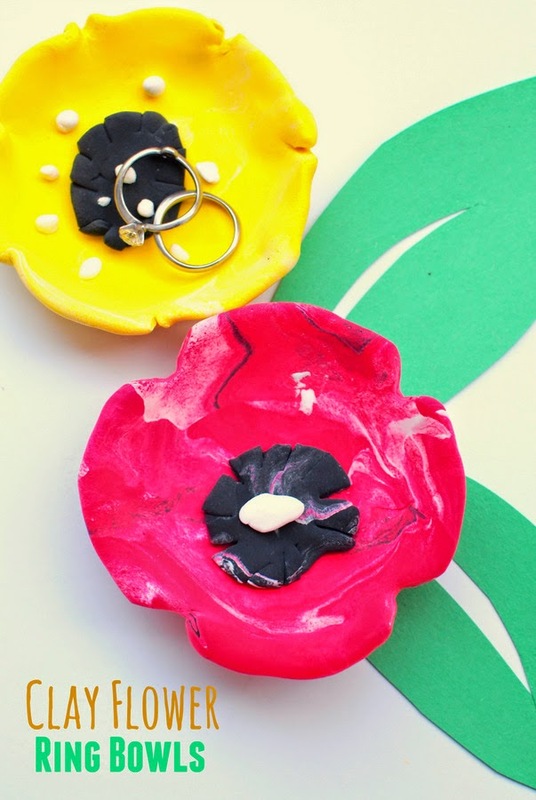 Looking for an art activity that's sure to entertain kids of all ages? 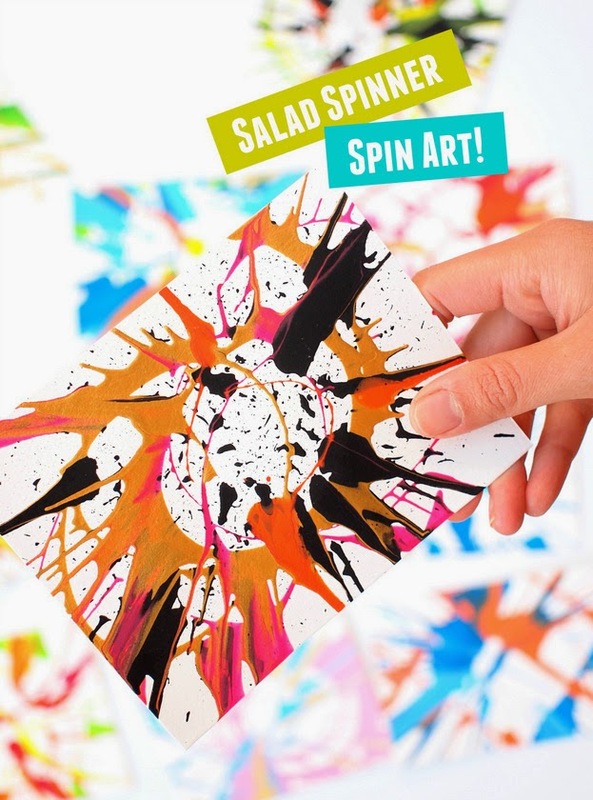 Then salad spinner spin art is just the activity for you! My husband, son, and I spent hours having fun making some colorful psychedelic artwork! 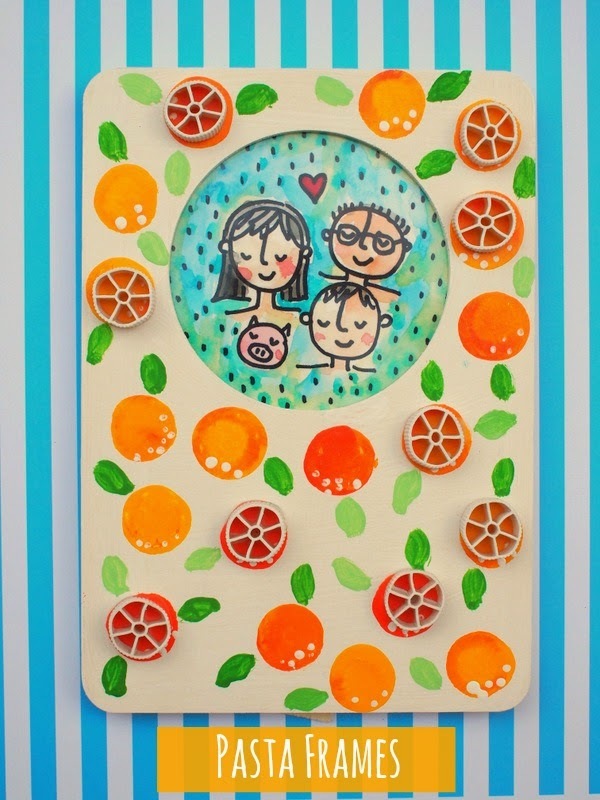 Easy Salad Spinner Spin Art! Easy, Giant DIY Scratchboard Art! Have you ever tried making scratch art (affiliate links)? It's seriously addictive. We recently bought a set of scratch art boards from our local toy store and had a BLAST doodling, tracing, and scratching. So after we used up all our boards....I got thinking. Why use tiny scratch boards...... when GIANT SCRATCH BOARDS could do? 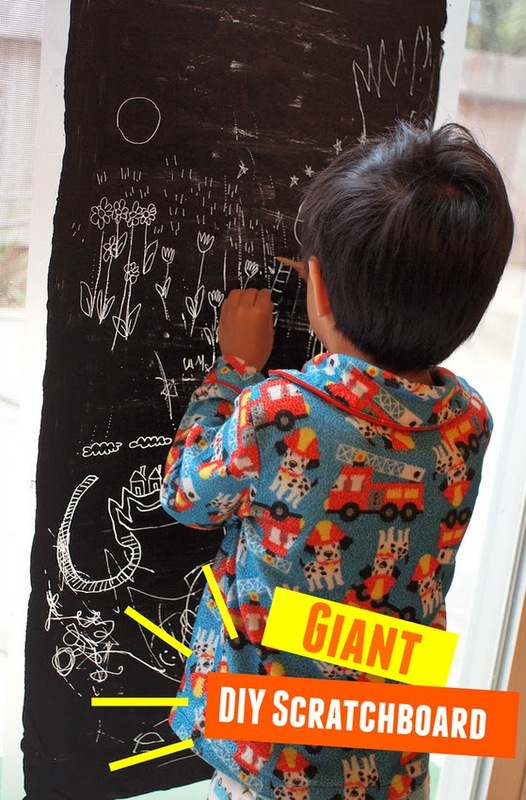 Super Easy, Giant, Homemade Scratchboards! Ah, oil pastels. After seeing that they could be used to decorate pumpkins, I thought they would be perfect for creating a cute and colorful rock tic-tac-toe game. What's up? 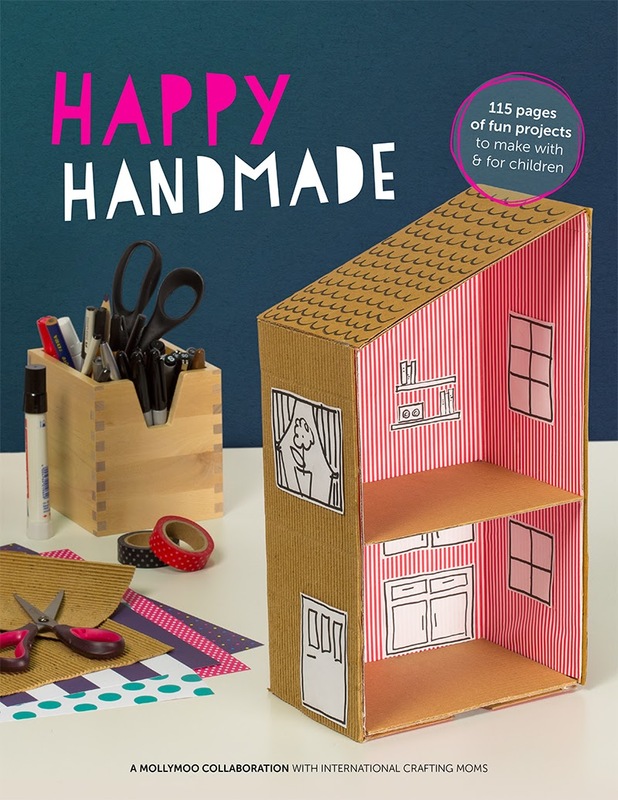 Happy Handmade- A Joint Craft eBook Adventure! Around this time last year, I shared my now-not-so-secret dream of being a professional crafter. Re-reading that post, I wish I could go back in time to hug my old-self, and tell her that I'm proud of her for taking a step in a new direction. Throughout 2014, I took several steps towards making that dream a reality. I pushed my super shy self to join a couple of really supportive kid blogger groups (like Kid Blogger Network, Rockin Art Moms , and the Creative Preschool Collaborators.) I dipped my toes into the super scary (and still, completely confusing) world of blog advertising and sponsorship. And, I also got the opportunity to do some freelance craft work for wonderful sites like Handmade Charlotte, MollyMoo Crafts, and DIY Candy. You're probably wondering now- Leslie, was it worth it? Are you raking in the big bucks? Well, yes. I'm glad that I took those initial steps. And no, I'm definitely not making big bucks. But, I do make some grocery money and I really appreciate the opportunities that come my way. 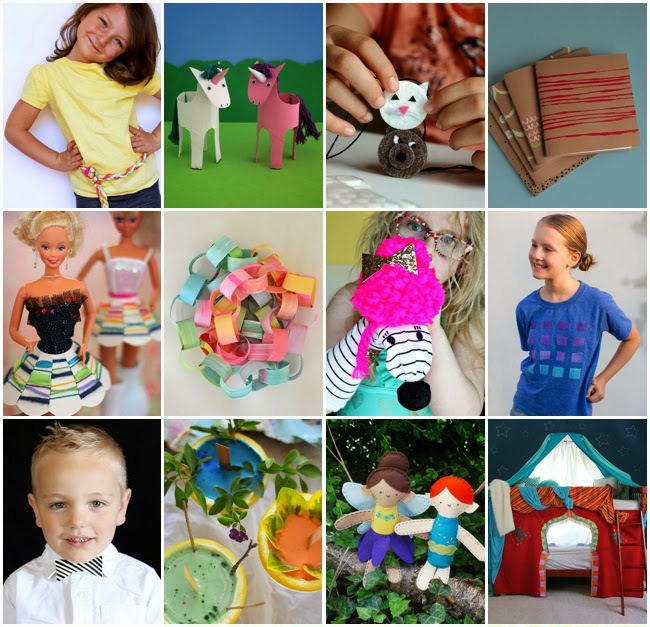 I recently had the opportunity to join with 17 other kid-craft-loving moms to put together Happy Handmade- a beautiful, unique and fun ebook showcasing 115 pages of crafts to make with and for kids! I'll be sharing more about the ebook and how you can purchase it on the blog this Tuesday, January 20th. But I just wanted to just write something about it today because there are just so many lovely and unique ideas inside. And my heart feels like it's bursting open because I'm so proud of all the work that went into it. Ok. That's all friends. Thank you for stopping by and thank you for all of your support. Hope you have a wonderful rest of the weekend, friends! With the nights still being quite long, we often find ourselves stuck inside twiddling our thumbs... and going kinda bonkers. 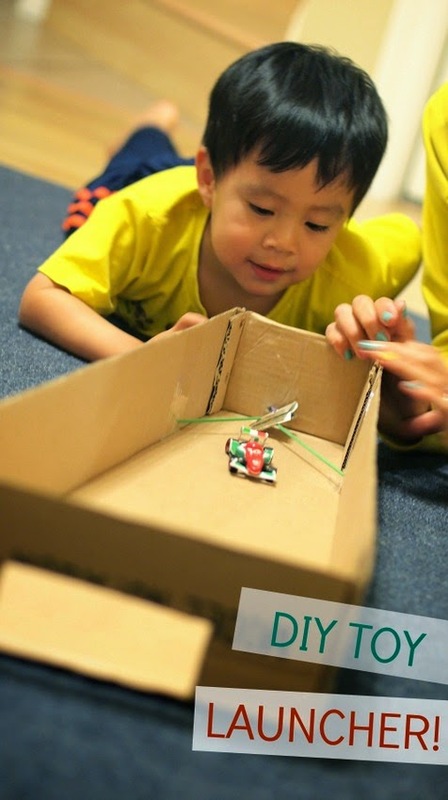 :) So one day we took matters into our own hands, and our family worked together to tinker and turn a long, narrow box into a DIY Toy Launcher! 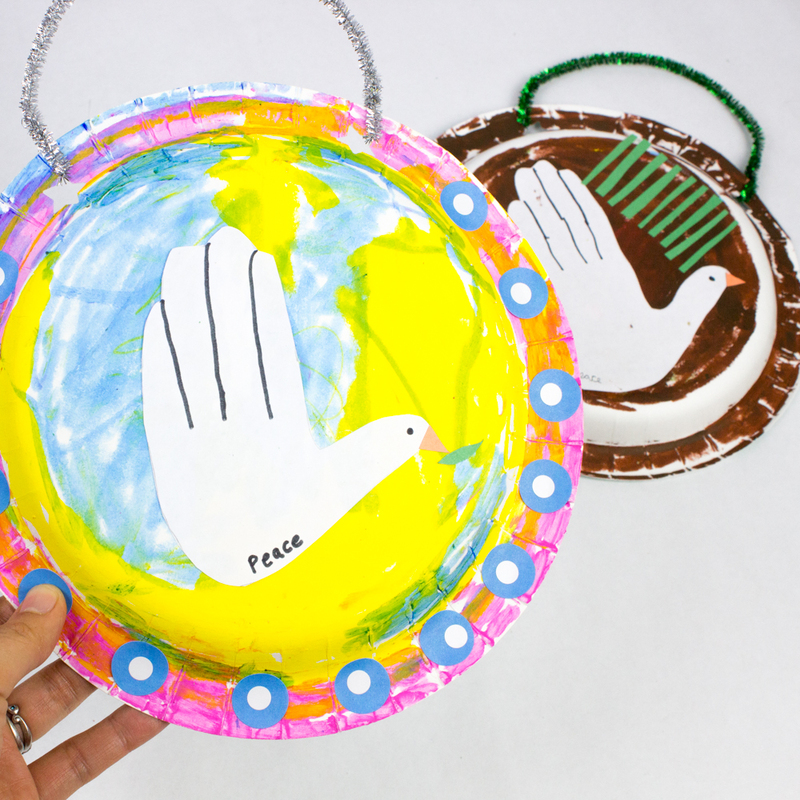 Ever find yourself wanting to do a quick craft with the kids that's different, easy to set up, and encourages creativity? 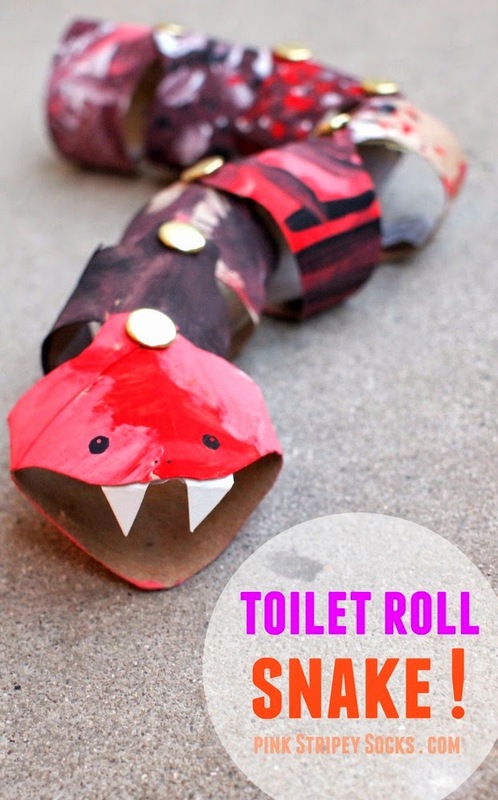 I think about that question all the time when I think up ideas for kids' crafts. I know that parents and teachers want to keep their kids entertained, but they also want them to use their minds too. And that's why I love these rubber glove finger puppets. You just need 3 materials and bam! 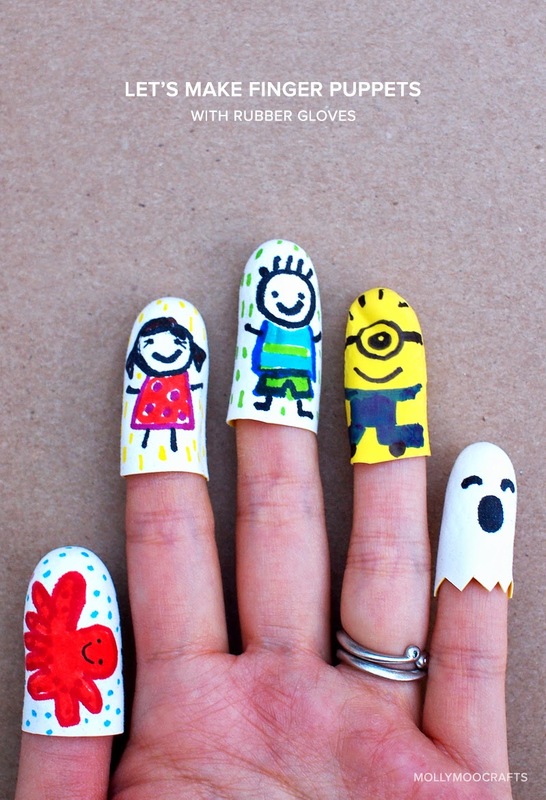 Now you have instant mini canvases for creativity and endless opportunities for storytelling and fun. To make these gloves, check out my tutorial for rubber glove fingers today on MollyMoo! Does your child love going to the grocery store? Does his/her face light up at the prospect of pressing buttons? 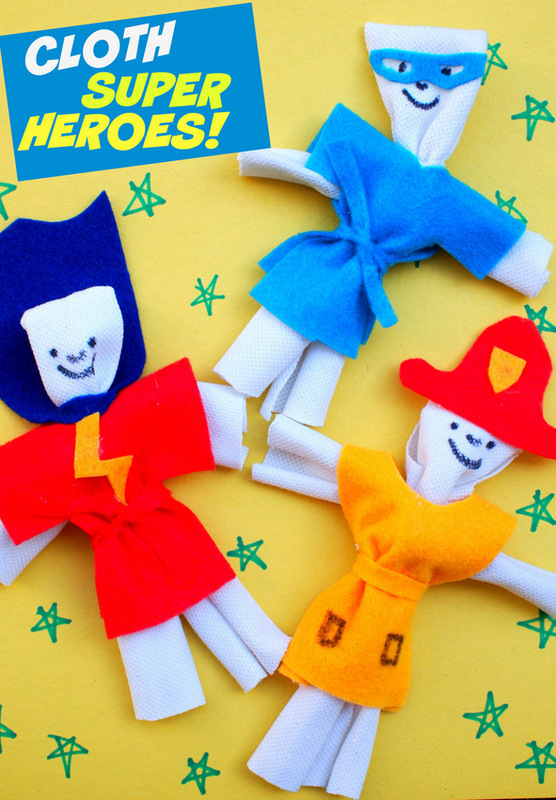 Then today's craft is perfect for you! Awhile back I was looking around at getting a cash register toy for Chuck. He loves watching the cashier scan our groceries, so it was a perfect toy to encourage imaginary play at home. After looking around online I then got to wondering. Could I make my own toy? And that's how this craft was born. This DIY cardboard cash register has pressable buttons, a sliding money drawer, a faux credit card scanner, and a changeable money display! Yup. Cool right? It's just right for little hands who love to push, press, pick, and pull. 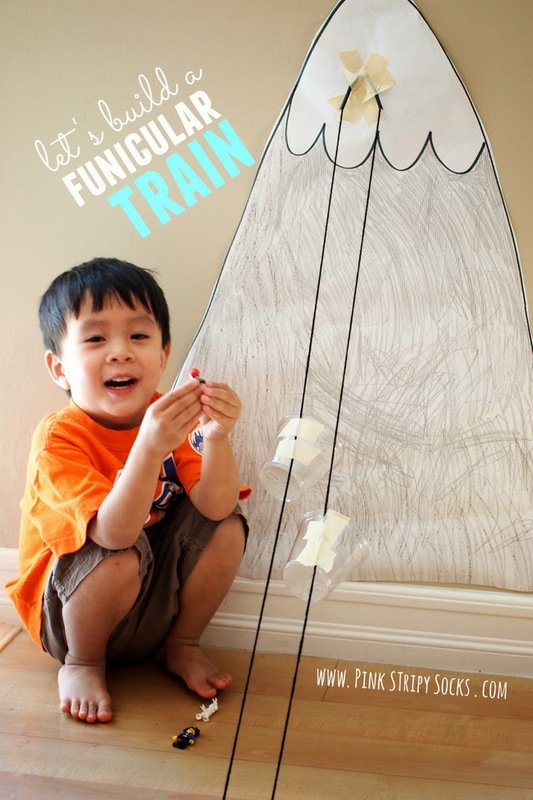 It's also a great way for kids to practice their math skills too! Interest piqued? You can see the full tutorial on Handmade Charlotte! I love making and creating things with Chuck. But sometimes I'm surprised by how much arts and crafts supplies cost. Whenever I go to Michaels or Target I always do a double-take when the bill comes up. What? How did we spend so much? Is this glitter made of 14K gold? To stretch our pennies (and my own creativity) I love making our own art supplies on the cheap. We've made our own Paint-With-Water Pages, 2 Ingredient Body Paint, sun prints with construction paper, and even used tortillas as canvases for art! With dozens of cardboard boxes lying around, I thought it would be fun to DIY Chuck an art easel. This DIY easel is so neat because it only took a couple of minutes to make (score! ), is made entirely out of cardboard (cheap!) , and can accommodate 1, 2, or even 3 children simultaneously painting. Whoa! Intrigued? Well let's get crafting! Apparently we've reached the stage where Chuck likes pretending to shoot things... and people. (Ack. Is this common? I'm assuming so... ) So I thought it would be fun to somehow make a toy that would actually shoot things, like a catapult or a slingshot. We always seem to have cardboard rolls lying around, so I built this cardboard roll rocket launcher toy. Then, we had a BLAST playing with it! Get it? Rocket launcher? Blast? Like blast off? Hee hee hee... wah wah wah. 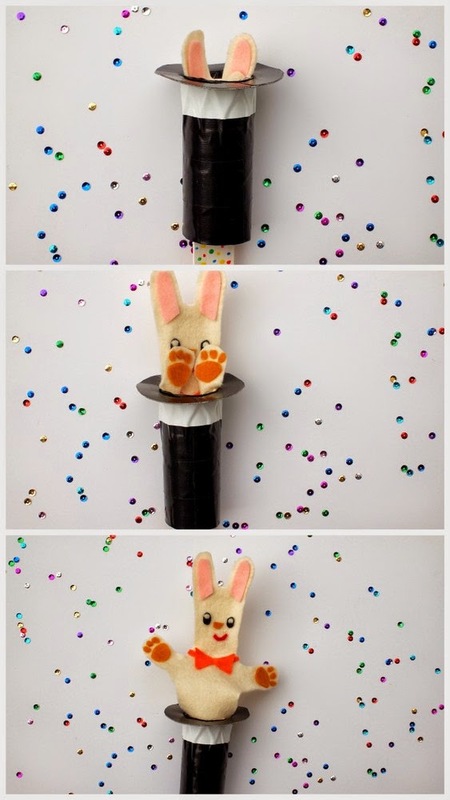 This rocket launcher toy uses rubber bands and cardboard rolls to shoot aluminum foil balls. It's so powerful that we can actually shoot a ball across our (small) patio... whoa, right? Since the balls are made from aluminum foil, they don't hurt. So you could create several launchers, shoot each other, and then not worry about anyone getting hurt. Excellent, right? 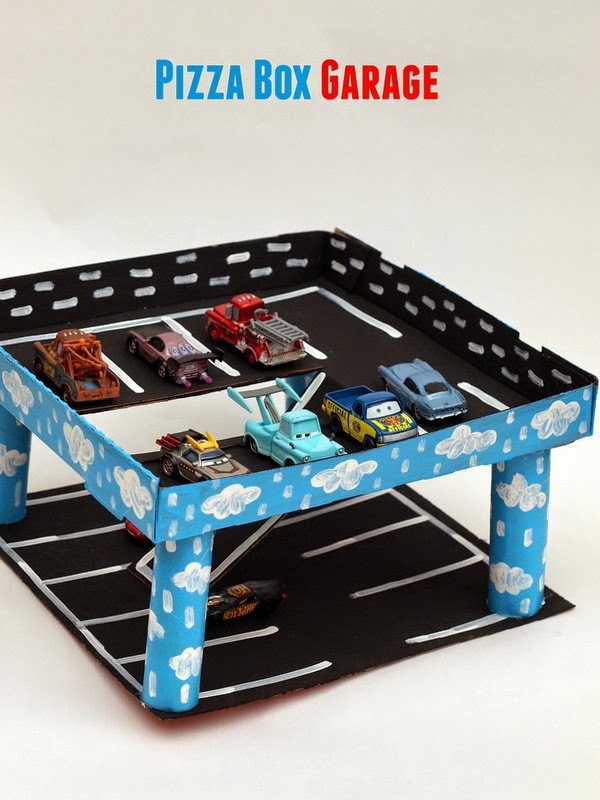 Keep on reading to build your own rocket launcher and see other cool DIY toys that you can make and play with your little one.